I missed the due date of my water bill again. The bill and mail couriers are having a hard time delivering because I do not have a regular mail box for I'm partial to custom mailboxes. I used to have one years ago but when a typhoon hit us hard and wrecked homes much less mail boxes, I never had the inclination to replace it. Do I need a mail box? I sure do! My neighbor is getting tired of receiving my mails and bills. She usually sits at her front porch and could easily be asked by the postman or bill courier. Most of my neighbors do not have personalized mailboxes too. One time, my neighbor's bill was left in between the wooden slats of my gate. The other day, I was fuming because I have not been receiving my subscription from a certain magazine. It's time! Time to get me a spanking new mail box. The best ones are made by Whitehall Mailboxes of course. 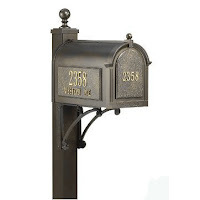 The company has a wide range of mailboxes: wallmount, postmount, column mailboxes, multi-unit, mail slots, and more. I like the one pictured here best.